If you’re not wearing your jeans for over a week at a time then you don’t even deserve to wear them. Get yourself some front-pleaeted dockers and get the HELL OUT OF H- oh god I spilled coffee on my jeans. Ew. This is gross. Ew. Some comics cut to close to the bone, brutal in their honesty I never thought I would say that outside of the world of Hagar the Horrible. Aye, friend. ‘Tis not Hagar that is horrible, but the truths that he bears. 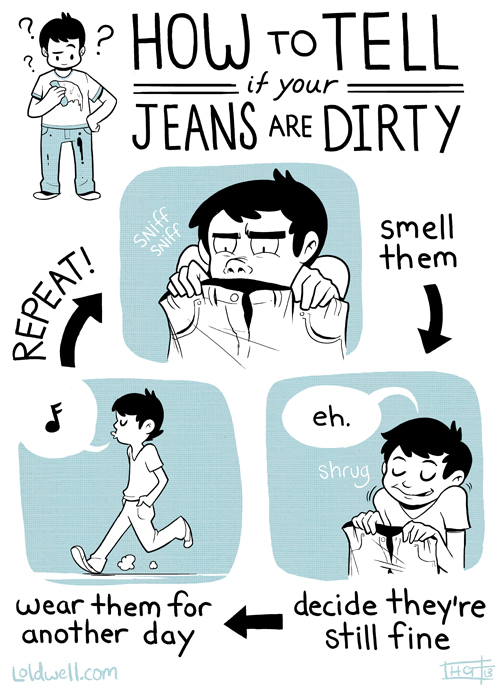 Jeans don’t get dirty. They get character. Damn straight guy, my co-workers cringed when I told them I wash my jeans once every half a year. What’s wrong with them anyway.